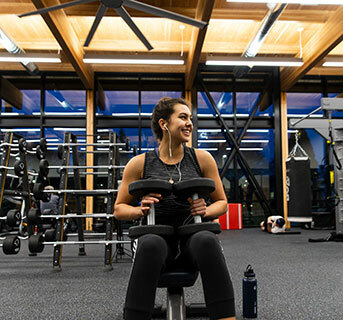 The beautiful fitness center with one of the best views on campus offers 4,200 square feet of space filled with cardiovascular and strength-training equipment. The facility provides a diverse selection of cardio equipment, including treadmills, recumbent and upright bikes, rowing machines, ellipticals, spin bikes and stair steppers. Also available are dumbbells, barbells, squat racks and a variety of selectorized machines. The 14-foot TRX training zone is a great piece of functional training equipment that offers a ton of options for getting in shape. Not sure how to use a piece of equipment? Our fitness center staff team is here to help! Come to the welcome center and one of our team members will be happy to assist you. For the comfort of our patrons and to create a welcoming, inclusive and safe environment, shirts and shoes are required throughout the facility. Shirts must cover, at a minimum, your sides/torso and midriff. Sports bras must be covered by a shirt of some type. Closed-toe athletic shoes must be worn in the fitness center. Sandals, open-toe shoes and hard-soled shoes are not permitted. All weights and equipment must be re-racked or placed in their designated location after use. Slamming or dropping weights is not permitted. Olympic and powerlifting exercises are not permitted. Equipment should not be leaned against the mirrors. Headphones must be used for listening to music. Equipment should be sanitized and wiped down after use. Personal belongings such as backpacks, purses and wallets should be placed in the day-use lockers located around the facility. Equipment must not leave the fitness center. No food, gum, protein shakes, supplements, glass bottles or cans are allowed. If you wish to carry a beverage with you, it must be water in a plastic container with a lid. Participants may not save equipment, or spots, for others.